An artist's concept of the TRAPPIST-1 worlds, based on available data about the planets' characteristics. 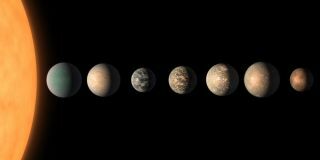 The largest of the worlds in the seven-planet TRAPPIST-1 system boasts an atmosphere that has evolved over time, rather than the one that formed with it. Observations made with NASA's Hubble Space Telescope reveal that the planet's atmosphere is different from its nascent environment, meaning it's most likely a rocky world similar to others in the system. Wakeford and her colleagues used Hubble to study TRAPPIST-1 g, the sixth planet from the star. They had previously probed the atmospheres of the first five planets, identified by the letters b through f, and found that all five planets lack the massive hydrogen atmospheres that indicate gas giants, making them more likely to be rocky. Their previous study had not been precise enough to determine whether or not TRAPPIST-1 g carried its original atmosphere. "G was the last question mark in that," Wakeford said. "Just like its brothers and sisters, it doesn't contain its primordial atmosphere. It's got an evolved atmosphere." She presented the results in January at the winter meeting of the American Astronomical Society in Seattle. In 2016, astronomers at Chile's Transiting Planets and Planetesimals Small Telescope (TRAPPIST) announced their discovery of three planets around the dim star TRAPPIST-1. Four more worlds were discovered within a year, bringing the total to seven. All of the planets lie within the habitable zone of their star, the region where liquid water should be able to persist on a planet's surface. Only 40 light-years from Earth, TRAPPIST-1 contains the most planets known to lie within the habitable zone of a single star. TRAPPIST-1 g is the largest of the worlds, with estimates placing it at around 1.1 times the mass of Earth. If the planets are gas giants, they would retain their original, hydrogen-rich atmosphere. In contrast, rocky worlds have the power to change their atmosphere. The movement of carbon can play a key role in thee evolving atmosphere. Melting mantle magma traps carbon beneath the surface. As the magma moves toward the surface, the decreased pressure allows the carbon to escape in gas form. On Earth, trapped carbonate is released as carbon dioxide, a greenhouse gas that allows our planet to grow warmer by trapping heat from the sun. Past research reveals that worlds like Mars and the moon can also trap carbon-rich material, as well as other elements, and release them into the atmosphere in gaseous form. Their cool temperatures can also cause problems in the search for life. The low-mass M dwarfs can boast clouds and even water vapor in their atmospheres, much like the largest planets. These molecules can create false signals for astronomers trying to study the atmospheres of the worlds orbiting them. As a planet passes between its star and Earth, astronomers can study the light streaming through its skies to unlock some of the mysteries of the planetary atmosphere. Because they carry water molecules, M dwarfs can make the process more challenging; it can be difficult to determine whether signals suggesting the presence of water come from the planet or the star. "Because the star has these features in it, it means the measurements that you're making, you can't be 100 percent certain that it's not the star that you're measuring," Wakeford said. "You have to be able to rule out the presence and the effect the star is having on these planets." To help sort through the mess, Wakeford and her colleagues developed a method to remove the stellar contamination. First, they performed an in-depth study of TRAPPIST-1, examining how the star's temperature changed in different locations. "The star itself is a mixture of three different types of temperatures," Wakeford said. In general, the star is relatively cool, with a third of it covered in slightly warmer spots of 2,726 degrees Celsius (4,940 degrees Fahrenheit). Less than 3 percent of the star is covered with extremely hot spots at a temperature of 5,526 C (9,980 F). That's because TRAPPIST-1 is covered by star spots that Wakeford said are smaller and dimmer than those found on our sun. "The distribution of [the spots] is like salt and pepper — it's just spotted all over the place and evenly distributed," Wakeford said. By studying the star as an individual planet in its system passed between it and Earth, the astronomers were able to examine how the temperature from the star changed. An artist's impression of the rocky worlds orbiting the red dwarf star TRAPPIST-1. "We can actually use the planet as a probe of the star's temperature properties," Wakeford said. With that information in hand, the astronomers then examined the atmosphere of the planet itself, confident that they could account for molecular signals coming from the star. They were able to rule out the large, puffy hydrogen atmosphere around g that would have suggested that it was a gas giant rather than a rocky world whose air had been changed by geological and atmospheric processes. "That really leads to the true terrestrial nature of this planet," Wakeford said. The team also used their measurements to calculate the planet's radius at 1.124 times the radius of Earth, giving it a density just below our planet's. This fits TRAPPIST-1 g firmly: It's a rocky world. With six of the planets out of the way, the astronomers hope to turn their attention to the seventh and final object, TRAPPIST-1 h. They plan to study the planet during the summer of 2019. "It's going to be really exciting to apply this method again, not only to see what the planet's made of but to see how the star's changing and affecting this planet," Wakeford said. Furthermore, the process that they developed to separate out water-vapor contamination from TRAPPIST-1 could also be applied to observations of other M dwarfs. The research was published in late 2018 in the Astronomical Journal. Follow Nola Taylor Redd on Twitter @NolaTRedd. Follow us on Twitter @Spacedotcom and on Facebook. Original article on Space.com.